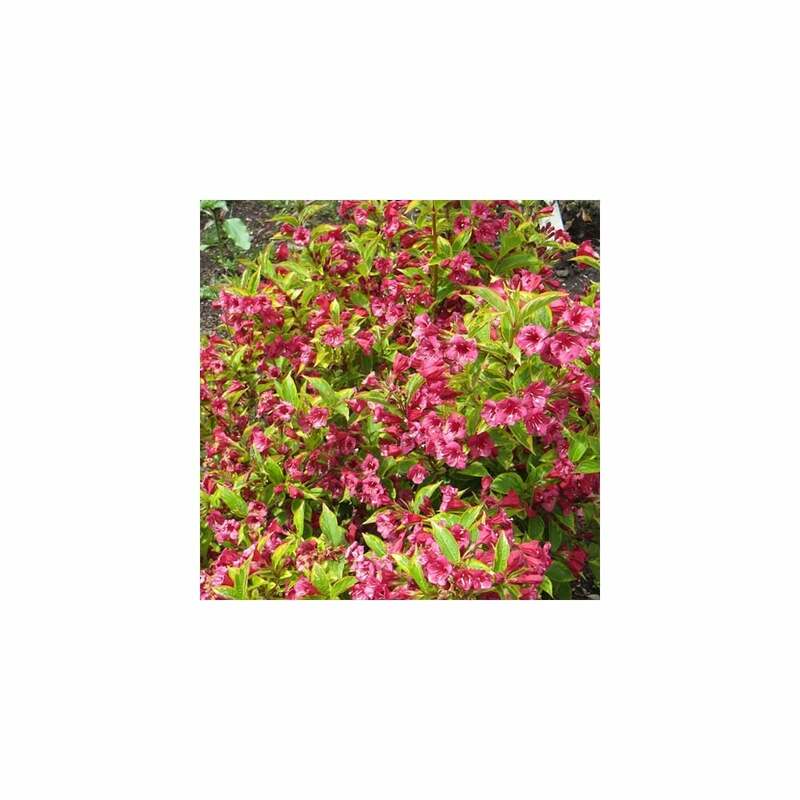 Briegela is a beautiful Weigela variety that is ideal for garden hedging and screening purposes. Also known as the French Lace, Weigela is a vigorous deciduous shrub with dense, upright and rounding habit that makes it a perfect flowering border bush. This bush is easy to grow, does not demand too much but full sun and can reach a height up to 2 - 3 metres. It creates a dramatic display of colours in spring with red flowers shining over its variegated foliage. Weigela Briegela produces clusters of trumpet-shaped rose-pink flowers in May and June. These gorgeous flowers make up an attractive and lush garden ambience, attracting butterflies and hummingbirds to your plants. Its ovate green-yellow foliage that is margined with creamy yellow acts as a colourful backdrop for the red flowers. Often in mid-summer to late summer, a repeat bloom can be experienced. This variegated foliage and showy flowers make Briegela ideal for highlighting low light spots in the garden. It will thrive in any type of soil that is slightly moist and well-drained. This shrub will thrive in full sun, in fact it prefers a sunny position in the garden. Unlike other variegated plants, its foliage does not burn in sun and the blooming performance is enhanced in full sun. These are hardy flowering plants that are easy to grow and care for. They need little pruning right after the flowering period. Cut back a few branches to encourage new growth. These shrubs need moderate watering, but once established, they will develop more resistance to dry conditions. Briegela are ideal in groups as borders or hedges. Use them as large border shrubs that will decorate your garden with dazzling flowers all spring and summer. These are perfect plants for cottage garden, city garden and informal gardens.